The UK government should look to what is happening to free expression in Egypt and Turkey before broadening terrorist laws to include those who "spread hate". 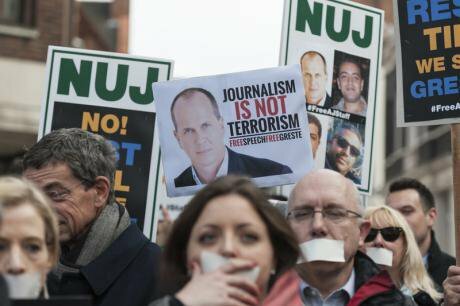 Protest outside London's Egyptian embassy in solidarity with Al Jazeera journalists. Demotix/ Lee Thomas. All rights reserved.The arrest by Turkey of journalists for Vice News, just two days after the sentencing of Al Jazeera reporters in Egypt, demonstrates how easily terror laws can be abused to stifle a free and independent media. It should be a wake-up call for the UK, which in the next few months will introduce yet another piece of anti-terrorism and extremism legislation that could be used in much the same way. On Monday, two British reporters and a translator working for international news organisation Vice News were charged by a Turkish court for “working on behalf of a terrorist organisation”, after filming clashes between government forces and Kurdish militants. The charges came just days after the sentencing in Egypt of three Al Jazeera journalists – accused of aiding the banned Muslim Brotherhood – for “spreading false news”. The injustice in both cases is patent. In both cases laws meant to tackle terrorism and extremism are being used against journalists simply trying to do their job: to report the news. Tobias Ellwood, the UK Minister for the Middle East and North Africa, said he was, "deeply concerned by the sentences handed down” against the journalists in Egypt. But what should also be concerning us is how easily that could happen in the UK as the government seeks ever broader powers, and definitions of terrorism that uses language little different to that being used to charge journalists like those of Vice News and Al Jazeera. The UK government already defines extremism very broadly, as “the vocal or active opposition to fundamental British values, including democracy, the rule of law, individual liberty and the mutual respect and tolerance of different faiths and beliefs” – a net wide enough to catch Islamic fundamentalists, neo-Nazis, but also potentially anyone who preaches, for example, against gay marriage. But the government is not content. Now it says it needs new laws to tackle those who "spread hate but who do not break existing laws". And that is a net wide enough to catch, well, pretty much anyone who says anything with which the current government - or mainstream popular opinion - disagrees. Conservative MP Mark Spencer argued last month that proposed new banning orders intended to clamp down on hate preachers and terrorist propagandists should be used against Christian teachers who teach children that “gay marriage is wrong”. And if that could be the case, it takes little imagination to see that "spreading hate" could easily be applied to those journalists who report on those groups and individuals who have hateful messages. The government will argue that this is not how the law is intended. But you only have to look at communications intercept laws to see how easily “intentions” can be subverted and abused in practice. Police officers used powers afforded by the Regulation of Investigatory Powers Act (RIPA) – an act intended to deal with terrorists – to pull the phone records of Sun political editor Tom Newton Dunn so it could track down the officers accused of leaking information to the Sun over “Plebgate” – an incident with no terrorist implications whatsoever in which a minister was accused at swearing at the police. The new extremism bill will be no different. It will give the government powers to ban a host of groups from speaking or publishing, powers that can easily be used to silence those not just with whom the government disagrees, but those on whom we rely to convey information – even when that information, as is so often the case with those brave enough to report on the most violent extremism, is deeply unpalatable. Britain has rightly described itself as shocked by the Al Jazeera verdict in Egypt. I hope it will be vocal in its condemnation of the arrest of VICE News’ journalists in Turkey. And I hope it will then reconsider its plans to introduce new terror laws that will stifle free expression and a free media.